WASHINGTON- House Speaker Paul Ryan (R-Wis.) said that it would be unnecessary for Attorney General Jeff Sessions to recuse himself from a potential Justice Department investigation into the Trump Administration’s Russia ties unless Sessions became the target of the probe. 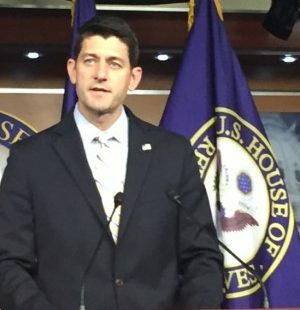 “I think he answered that question this morning; which is if he himself is the subject of an investigation, of course he would, but if he’s not, I don’t see any purpose or reason to doing this,” Ryan said in response to a question at a news conference on Thursday. Ryan told reporters there is no evidence suggesting Donald Trump’s campaign was involved. The Washington Post reported Wednesday that Sessions had met twice with Russian Ambassador Sergey Kislyak during the 2016 presidential election. Two weeks ago White House National Security Adviser Lt. Gen. Michael Flynn resigned following reports the he had diplomatically engaged Kislyak prior to President Trump taking office and that Flynn may have misled Vice President Mike Pence about the conversation. The reports suggested Flynn gave Kislyak the impression that the incoming administration might be willing to consider lifting sanctions that were imposed on Moscow following Russia’s 2014 annexation of Crimea from neighboring Ukraine. Then-Senator Sessions during his January confirmation hearing told the Senate Judiciary Committee that he did not recall any members of the Trump campaign having contact with Russian officials. Following The Washington Post’s report Sessions issued a statement suggesting that the he had never met with the Russian Ambassador. Then on Thursday Sessions’ spokesperson confirmed to NBC News that the meetings had taken place and said that Sessions’ Judiciary Committee statement was not misleading because the meeting with the Russian Ambassador comported with standard protocol pursuant to his then membership on the Senate Armed Services Committee. Ryan at the news conference dodged a question as to whether he believed Sessions misled the Senate Judiciary Committee. “I’ll refer to the Senate Judiciary Committee,” Ryan told reporters. When asked if he would support the appointment of a special prosecutor to investigate the Trump Administration’s reported ties with Russia, Ryan again dodged the question. “We don’t even have the law,” Ryan said. Senate Minority Leader Chuck Schumer (D-N.Y.) and House Minority Leader Nancy Pelosi (D-Calif.) have both called on Sessions to resign and have also asked for the appointment of a special prosecutor. Several high-ranking Congressional Republicans such as House Majority Leader Kevin McCarthy (Calif.) and House Oversight Committee Chairman Jason Chaffetz (Utah.) suggested Thursday that Sessions should recuse himself from a potential DOJ probe into the Trump Administration’s reported Russia connections. The House and Senate Select Intelligence Committees are investigating Russian election interference.